The main reason for our visiting Alaska was to view its wild animals. We were not disappointed. 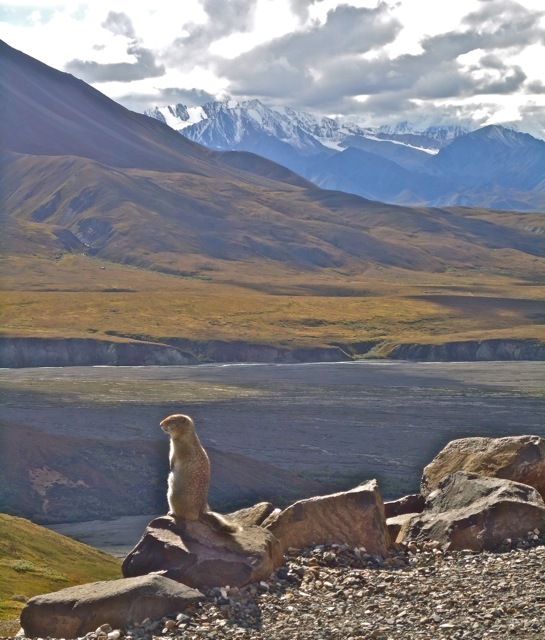 The arctic ground squirrel was referred to as BFC, the bottom of the food chain. They were abundant and inquisitive. This one perched on rocks and surveyed its majestic kingdom, until an eagle or a wolf came along. 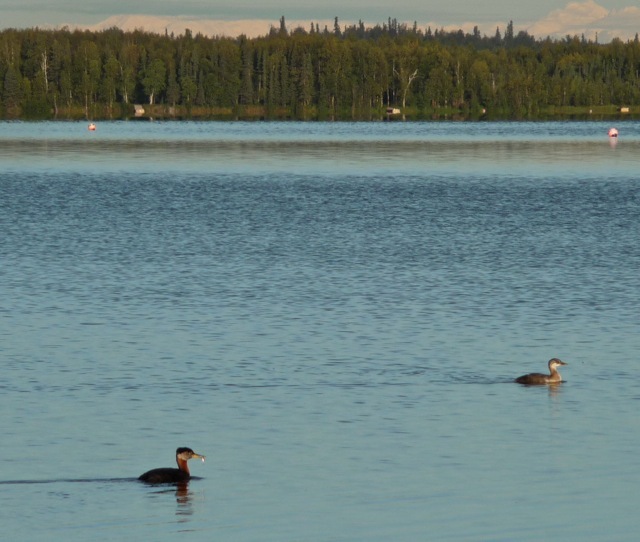 These two loons (潛鳥) swam and dived in the lake by our B&B lodging. Upon closer examination of our pictures, we noticed this loon had a small fish in its beak. Dinner was served. Other birds ate bigger fish. 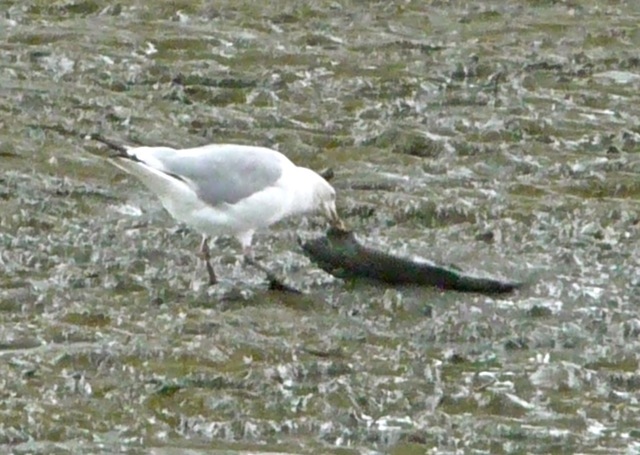 This sea gull pecked away at the carcass of a salmon on a muddy river bank. At the bottom of the Russian River Falls, dozens of salmons mill around in a deep pool trying to figure out a way to leap over the big falls. We saw some salmons leap up cascades. Nearby, a salmon ladder had been built with small steps of cascading water to help salmon climb to the top of the falls. 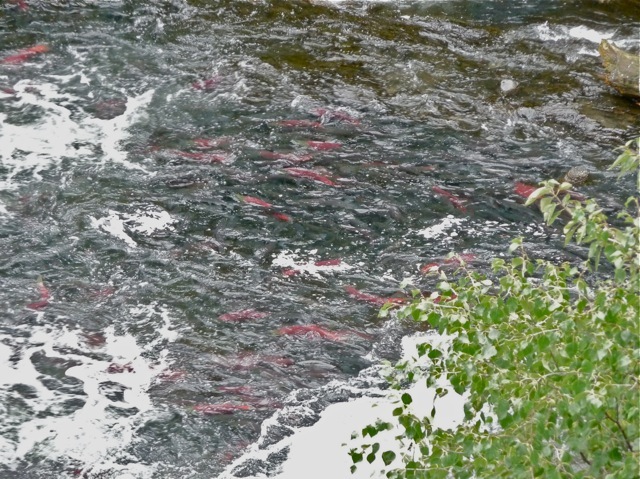 Eventually, some of these salmon would find their way up that ladder. 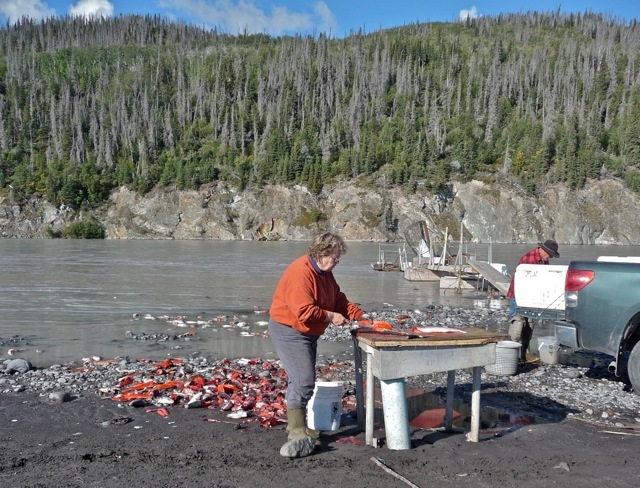 On Copper River, dozens of fish wheels churned and swept salmons from the river into holding tanks. One fish wheel can catch dozens of salmons a day, making a comfortable living for a fisherman. This woman was busy filleting freshly caught salmons and discarding fish heads and guts to the hovering sea gulls. 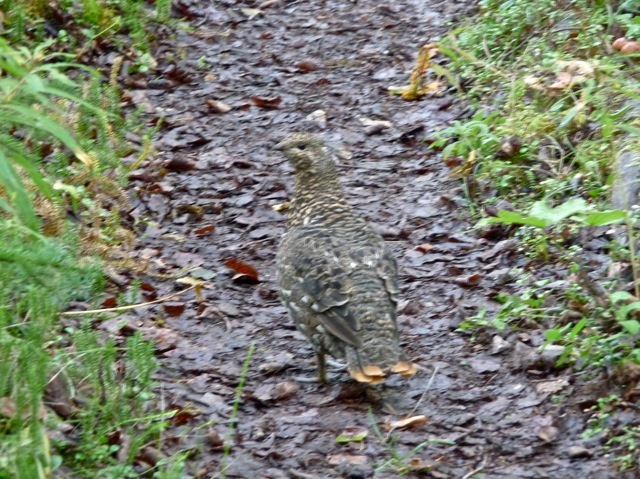 We saw this grouse hen on a trail. When it remained still, it was almost impossible to distinguish it from the leaves on the ground. 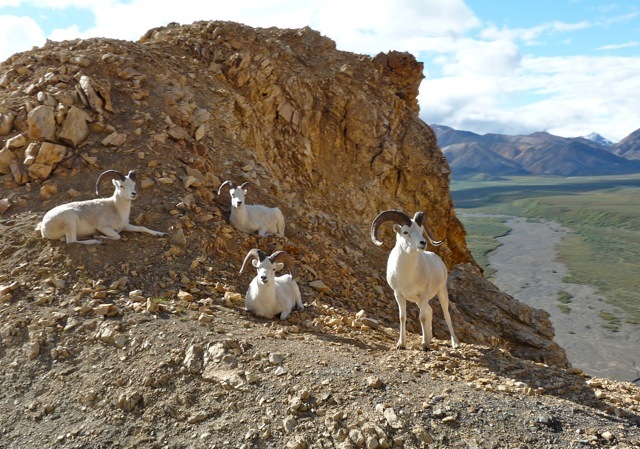 These four Dall sheep rams were sighted on a buff high above the glacial steam bed. They were resting by the road, and remained unperturbed when our bus stopped next to them. 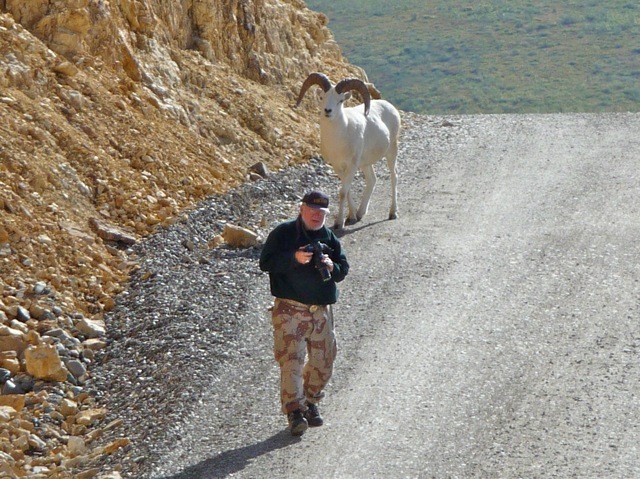 But when a man approached them on foot, against all warnings to keep away from animals, one ram challenged him and forced him to back away. Mooses are the biggest deers in the world, with males weighing up to 1,500 pounds. 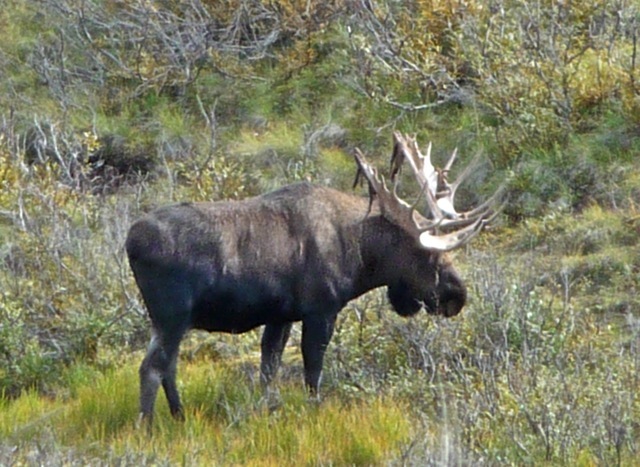 The male moose grows new sets of antlers each year, shedding the outer skin (velvets) when the antlers are fully grown, and uses them to fight other males for the right to mate. 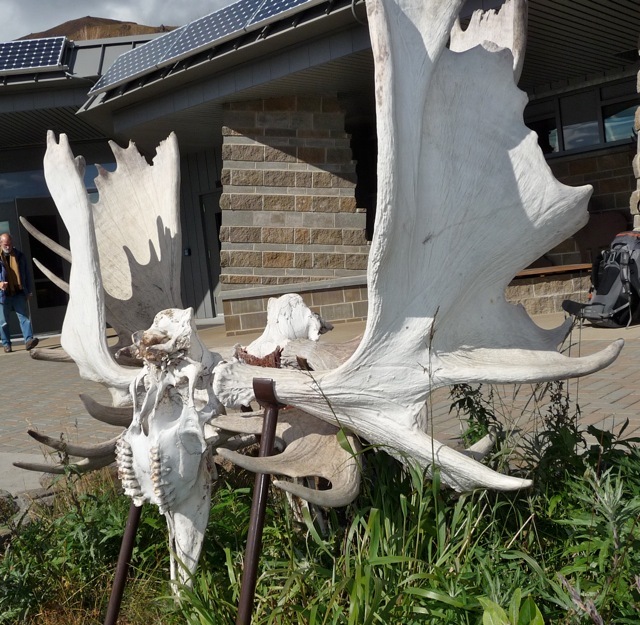 These two moose antlers were on display in the Denali National Park. They were the result of two male moose locking antlers while fighting, one antler piercing the other’s eye socket, and eventually both died locked in a death embrace. 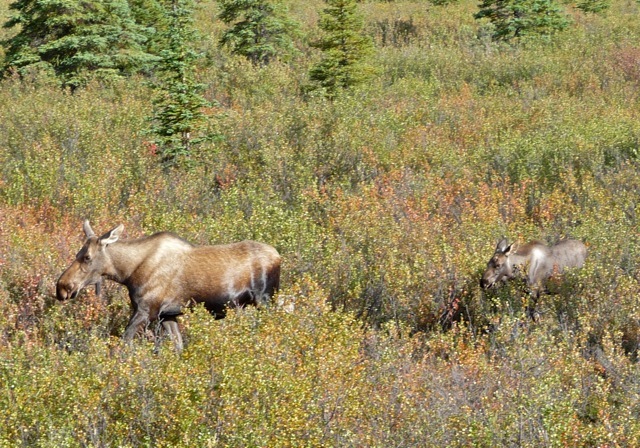 This mother moose grazed with her calf. With their big long noses, moose have faces only a mother, or an offspring, would love. When we were in the Park tour bus, somebody yelled “stop” to signal the sighting of an animal. I looked in the direction and saw nothing except a ridge beyond a meadow. 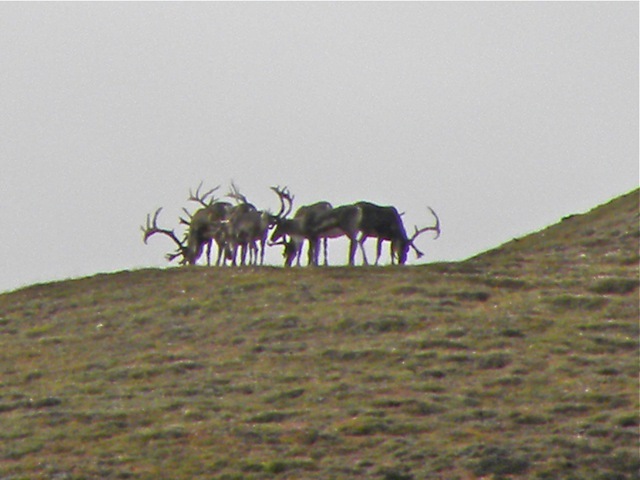 With my digital camera’s 24X zoom, I was able to catch sight of six caribous standing on the ridge. They were in the center of the last photograph. When these animals cannot stand the biting flies, they would stand on a ridge where the wind would keep the flies away. I am not using one of the professional digital single lens reflex (DSLR) cameras. They are too heavy to lug around and require exchangeable sets of heavy lens. This picture was taken with a “prosumer” digital camera that looked like a DSLR but with a fixed zoom lens. I am satisfied with its performance. 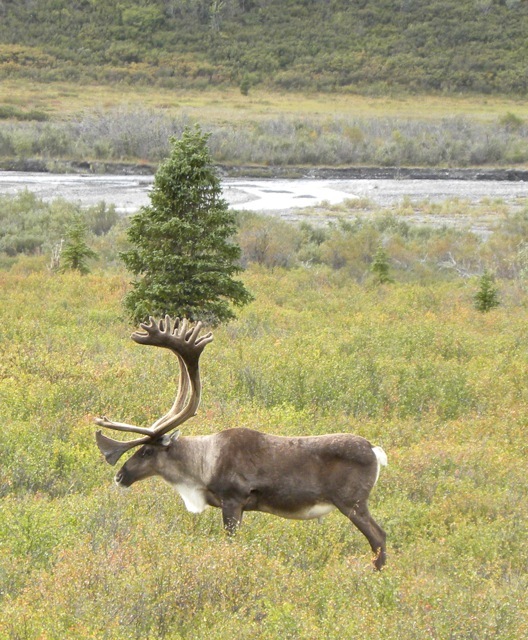 This caribou stood in a meadow, balancing a tree on its gigantic antler. 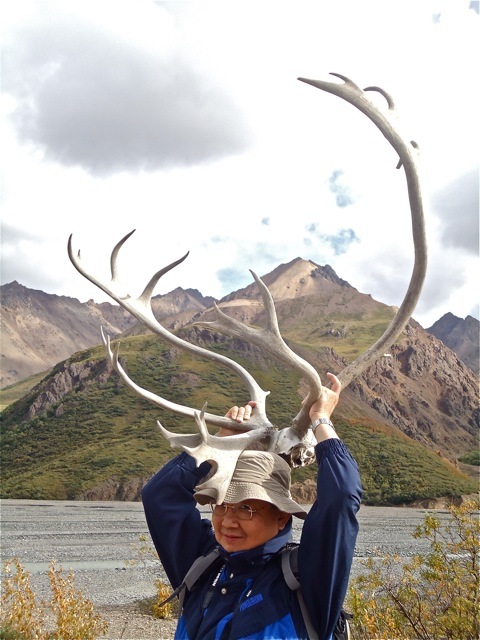 I held up a discarded caribou antler. It weighted about 20 pounds. No wonder caribous usually kept their heads down under their weight. We saw a few grizzly bears. This one had a fearsome face. I would hate to meet it on the trail. 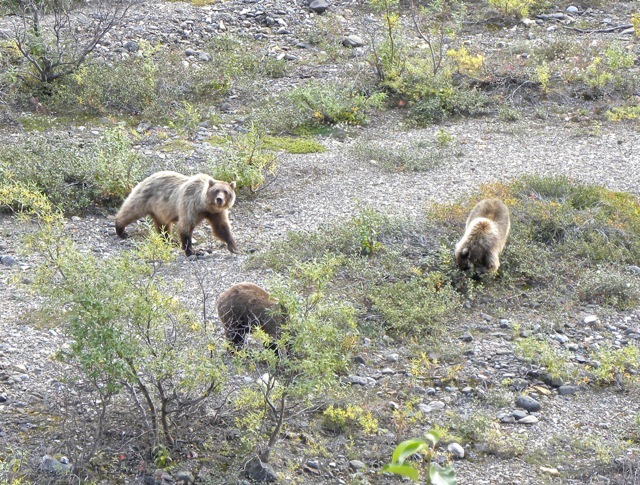 This mother grizzly led her two 2-year-old cubs on a berry picking outing. Mother grizzlies are the most dangerous when they are with their cubs. They were only 50 feet from our tour bus, but they ignored the bus as another harmless thing. So we had a good look at their grazing behaviors. Grizzly bears spend up to 14 hours a day grazing on the 50 kinds of berries in Alaska. 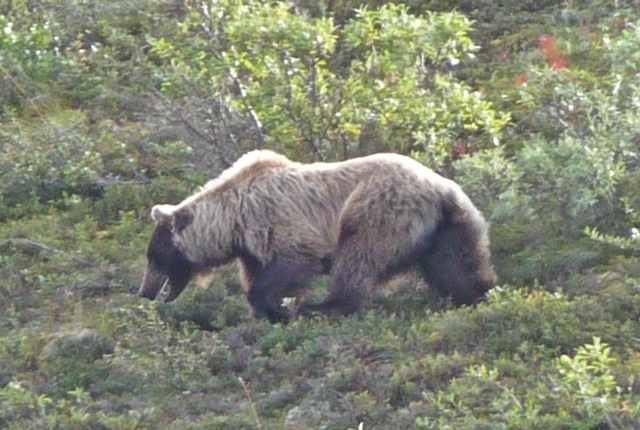 The grizzlies in Denali National Park have no access to salmons, and 90% of their diet are vegetation. By counting the number of berry seeds in the bears’ droppings, some researchers estimate bears eat up to 200,000 berries a day. That’s plenty of healthy antioxidants and fiber. 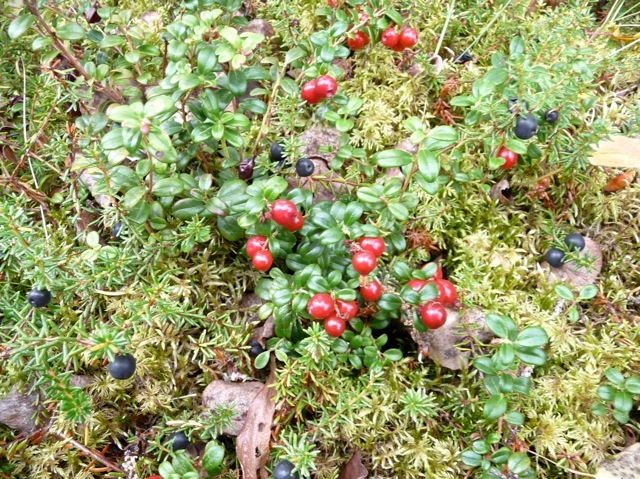 This picture shows the forest floor with red cranberries and black crow berries that ripened in late August. Wolf packs require a large piece of turf to hunt, making them scarce in the Park. 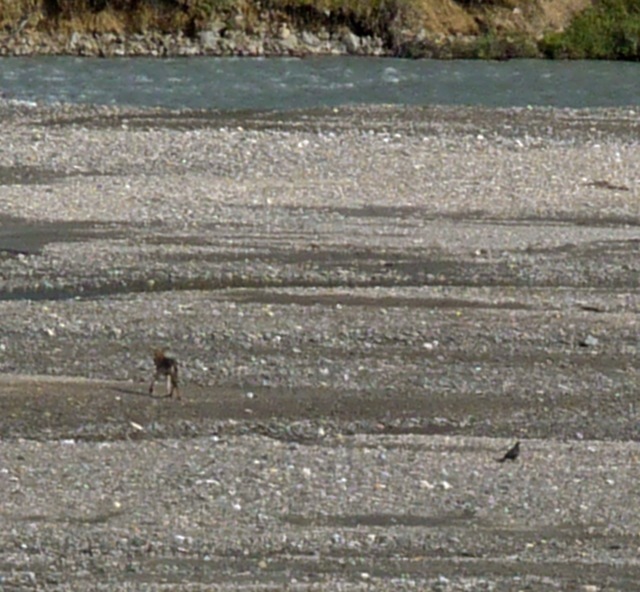 The only sighting we had was a wolf in a far distant stream bed. 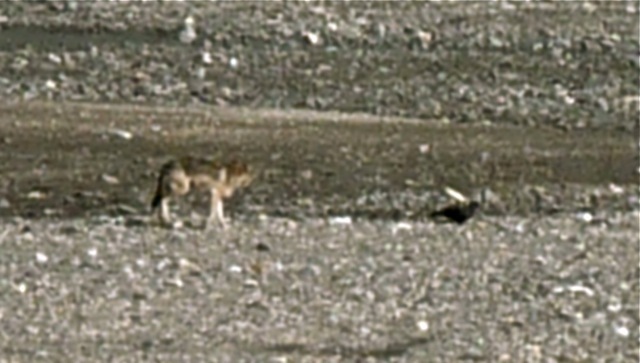 The lone wolf approached a crow, seeming to fight for a carcass. The crow stood its ground and refused to give in. The wolf was seen leaving the victorious crow. Having so little contact with wolves left me wanting. 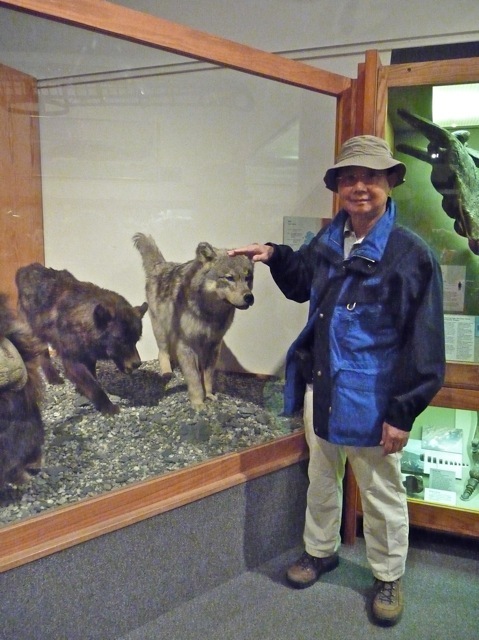 Here, I patted a wolf behind glass on the head in a museum. Wolves are large animals. 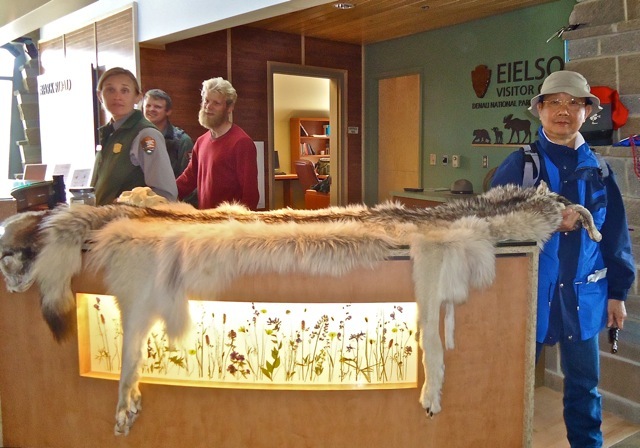 This wolf skin illustrated how long the wolf’s body was. The male wolves usually weigh 80 pounds, but extraordinary specimens can weigh up to 190 pounds. 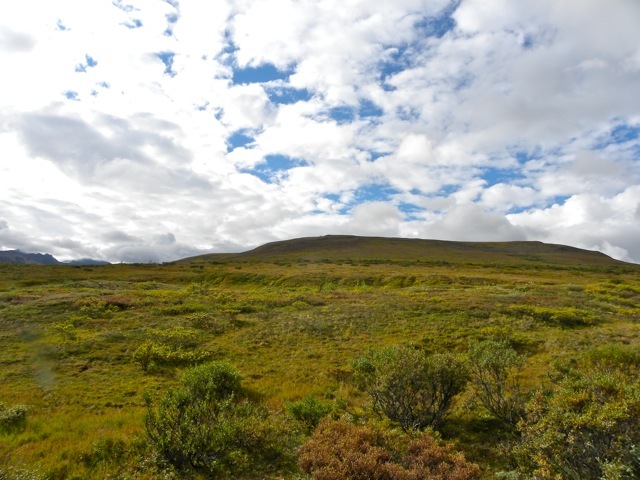 The Denali National Park keeps sled dogs for winter patrols. These dogs are extremely well cared for and live very well. I could not help but hug this gentle but detached dog. 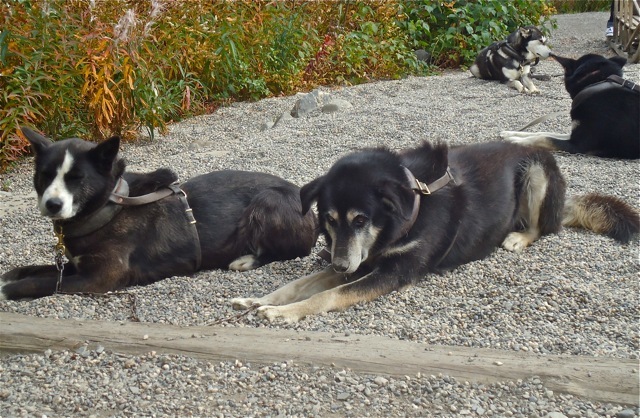 When hitched to their harnesses, these sled dogs got very excited and lunged forward. At the end of their short run, they rested quietly and waited for attention. Sled dogs are bred for their urge to run and pull, and they pull the sleds at astonishingly high speed. 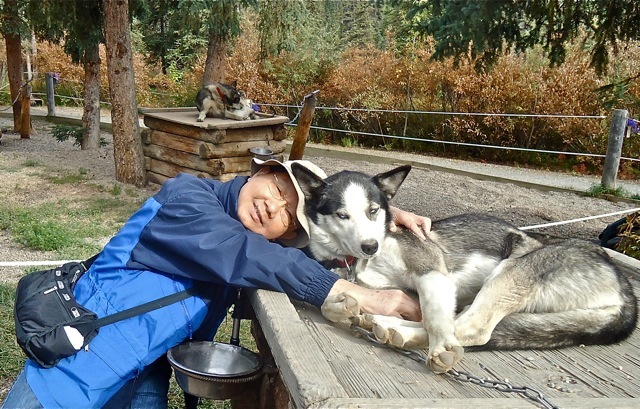 When sled dogs get to be 7 years old, they are retired from sled service and are adopted by Alaskan families as pets. 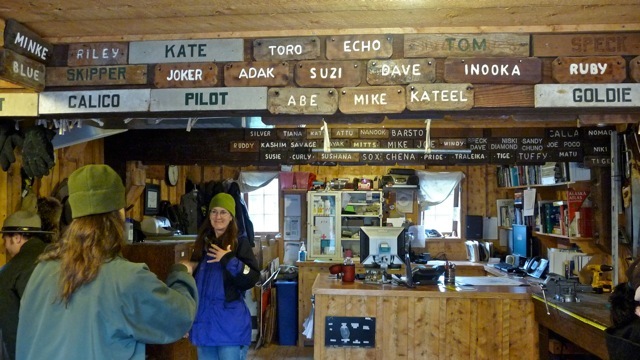 But they are lovingly remembered by the staff who hang up their dog house name tags in the utility shed. Posted by Robert Wu on Tuesday, September 7, 2010, at 3:34 pm. Filed under Uncategorized. Follow any responses to this post with its comments RSS feed. You can post a comment or trackback from your blog.